Most people will agree that there are many interesting things to learn about Kangaroos. You may already know a few basic things about what they do and their physical characteristics. However, chances are that as you read through these various facts you are going to learn plenty more about them. Kangaroos are the only large animal in the world that get around by hopping. They generally hop at a speed of about 13-15 miles per hour. However, when they feel they are in danger they can go about 40 miles per hour for short periods of time. They hop around for miles and miles every single day in search of enough food and water to sustain them. They don’t have a very long lifespan – the average is from four to six years. However, in captivity they can live for more than twenty years under the right conditions. Kangaroos don’t release any methane from their bodies. That is very unusual for animals that are herbivores. They often use the methane from their bodies for energy. They are very good swimmers and will get into the water in order to get away from predators when they need to. The young Kangaroos are called joeys. They are very small and fragile when they are born. They climb into the pouch of their mother immediately after birth. At that point in time they are only about the size of a lima bean. The females are able to delay the attachment of the fetus to the embryo when it comes to becoming pregnant with a joey. 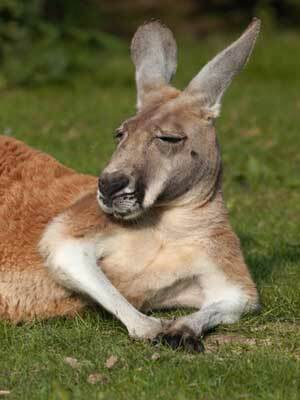 Kangaroos have poor eyesight, and many of them out there in the world are actually completely blind. It is believed that this blindness is a genetic characteristic. When Kangaroos are mating in captivity testing is done in order to make sure those with the genetic characteristic aren’t involved with mating. While Kangaroos do need to consume water, they can survive for many days in between drinking it.The toenails of Kangaroos are unbelievably sharp. When they are fighting with each other or predators they can slice that animal open with them while kicking forcefully. Groups of Kangaroos that live together are called mobs. They can actually turn their ears without moving their entire bodies in the direction of something that they hear. They are only able to move both of their back legs at the same time. They can’t move them individually. A Kangaroo with a severely injured leg is likely to die because it won’t be able to compensate for that and move around freely. The Western Grey Kangaroo gives of a very powerful odor that is nasty to humans. That is why they have been nicknamed as the Stinkers. The Red Kangaroo is the largest species and the smallest is the Musky Rat Kangaroo. The distance of 16 feet can be covered when a Kangaroo takes a single leap. The Musky Rat Kangaroo is the only species that doesn’t hop like the others do. There is one species of Kangaroo that is confirmed as being extinct. It is the Procoptodon Kangaroo. The pouch of females allows the young to have a higher rate of survival. The mother can travel many miles every day in search of food and then also for the occasional water that it needs. The mothers can actually determine if the offspring will be males or females. Generally she will have females when she is young and then males when she gets older. The young males leave their mothers completely about 2 years of age. The females though will stay around for twice as long. Therefore a mother could have a joey on the ground, one several months old in her pouch, and a new one in her pouch all at the same time.